Fumarolic activity continued from June through mid-October 2000. Volcanic tremor was slightly above background levels until it increased markedly at 1800 on 26 June. At 0751 on 30 June, seismicity indicated a short-lived vigorous phreatic(?) eruption. By 4 July, volcanic tremor decreased to background levels. Weak fumarolic activity continued to be observed, and on 22 July, a fumarolic plume rose 200-300 m above the volcano. On the same day, two small volcano-tectonic earthquakes occurred between Mutnovsky and neighboring Gorely volcano. Near noon on 31 July, a fumarolic plume rose 500 m above the summit. A single volcano-tectonic earthquake occurred under the volcano on 9 August. A gas-and-steam plume rose to a height of 200-300 m and drifted 5 km E. On 30-31 August, a gas-and-steam plume rose 100-500 m above the volcano and moved 1 km NW. Fumarolic plumes rose 200-500 m above the summit on 1 and 7 September. Occasional fumarolic activity continued throughout September with plumes reaching up to 300 m above the volcano. On 8 October, gas-and-steam explosions rose 800-1,000 m above Mutnovsky and drifted NW. The following day, similar explosions rose 300-600 m and the plume extended 2 km E.
KVERT reported on 11 January that seismic activity in the area of Mutnovsky and Gorely volcanoes was slightly elevated above background levels during the previous three weeks, but increasing activity was not confirmed. There is only one seismic station in the area of the two volcanoes so the source of the seismicity cannot be determined. Activity was not observed on satellite imagery. The level of Concern Color Code was lowered to Green. The Concern Color Code at Mutnovsky was reduced from Yellow to Green during 3-10 June. There were no significant changes in volcanic activity during the week. A thermal anomaly was observed at the volcano on satellite imagery, possibly due to the heat from a thermal field. During fieldwork on 17-18 September, two geologists from the IVGG noted large rock avalanches within the summit crater at intervals of several hours and intense melting of the glacier inside the crater. The observations indicate that activity inside the crater has increased compared to last year. The next day, a large rockslide (hundreds of thousands of tons of material) buried ~300 m of a trail in the crater under big blocks up to several meters high. Explosions from a vent in the central part of the crater ejected boiling mud several meters high. IVGG is advising hikers and other visitors to stay out of the crater until further notice. Mutnovsky consists of four coalescing stratovolcanoes of predominantly basaltic composition with multiple summit craters. Holocene activity has been characterized by slight to moderate phreatic and phreatomagmatic eruptions. There have been 18 reported eruptions since historical activity began in the 17th century. The most recent activity was from December 1960 to January 1961, when weak explosive eruptions sent a gas-and-ash column 3.5-4 km high. On 25 November, a fumarolic plume was observed rising to a height of 1 km above the crater. Information Contacts: Tom Miller, Alaska Volcano Observatory (AVO), a cooperative program of a) U.S. Geological Survey, 4200 University Drive, Anchorage, AK 99508-4667, USA (URL: http://www.avo.alaska.edu/), b) Geophysical Institute, University of Alaska, PO Box 757320, Fairbanks, AK 99775-7320, USA, and c) Alaska Division of Geological & Geophysical Surveys, 794 University Ave., Suite 200, Fairbanks, AK 99709, USA; Vladimir Kirianov, Kamchatka Volcanic Eruptions Response Team (KVERT), Institute of Volcanic Geology and Geochemistry, Piip Ave. 9, Petropavlovsk-Kamchatsky, 683006, Russia. Prior to 24 March 2000, KVERT (Kamchatkan Volcanic Eruption Response Team) had not included Mutnovsky in any activity reports this year. As of 28 April 2000, KVERT temporarily suspended operations because of a lack of funding. After more precise analysis of visual reports from Petropavlovsk-Kamchatsky and a comparison of signals from several seismic stations, KVERT determined that at 0700 on 17 March, a short-lived explosion sent a gas-and-steam plume to heights of ~1,000 m above the volcano; the plume disappeared within 30 minutes. At 1300 on 17 March, another gas-and-steam plume rose to about the same altitude and extended to the SE; activity ended by 1700. A corresponding shallow seismic event was registered at 1856, followed by a low-frequency (1 Hz) volcanic tremor. The hazard level was originally Yellow but was returned to Green later in the month, although episodes of low-level, low-frequency volcanic tremor continued. The volcano occasionally was obscured by clouds. An increase in volcanic tremor occurred on 1 April from 1300-2100 and again at 0930-1700 on 13 April. The volcano remained quiet through the rest of April. Two minor phreatic explosions occurred at Mutnovsky on 17 March 2000 (see BGVN 25:04). Subsequent helicopter observations indicated that the eruption took place in the N crater of the volcano. This crater had been active prior to the middle 1950's, but was snow-and-ice filled over the last 20 years. The recent eruption produced small amounts of ash and blocks of altered rocks. Clearly expressed precursors had provided strong indications that an eruption could be expected. In effect, scientists noted that over the last 20 years the heat output from the main crater increased and was accompanied by the appearance of new fumarolic grounds and an increase in the fumarolic temperature. They also detected a sudden activation of the alpine glacier had started about 5 years ago. Scientists also observed that during the last 5 years, the relative abundance of the chemical elements S/Cl and S/F in the water of Vulcannaya River, which drains the fumarolic fields of the NE and SE craters, increased 3- to 5-fold. The low magnitude of the 16 March event, the seismicity which continued afterwards for several months, and the relatively long period of preparation may indicate that the explosion is merely a precursor to a stronger eruption in the near future. Information Contacts: George Gavrilenko, Institute of Volcanology, Far East Division of the Russian Academy of Sciences, Petropavlovsk-Kamchatsky, 683006, Russia; Yuri Taran, Institute of Geophysics, UNAM, Mexico D.F. 04510 Mexico. Massive Mutnovsky, one of the most active volcanoes of southern Kamchatka, is formed of four coalescing stratovolcanoes of predominately basaltic composition. Multiple summit craters cap the volcanic complex. 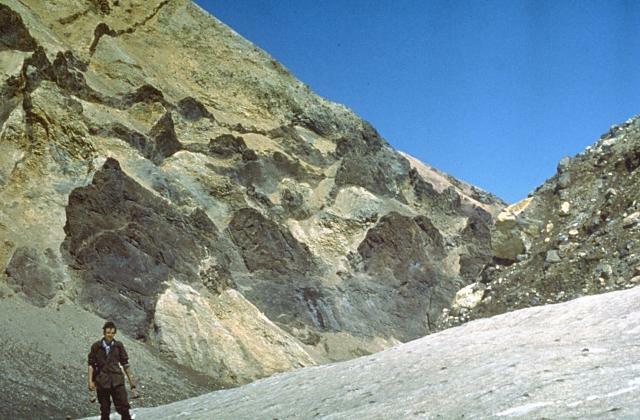 Growth of Mutnovsky IV, the youngest cone, began during the early Holocene. An intracrater cone was constructed along the northern wall of the 1.3-km-wide summit crater. Abundant flank cinder cones were concentrated on the SW side. Holocene activity was characterized by mild-to-moderate phreatic and phreatomagmatic eruptions from the summit crater. Historical eruptions have been explosive, with lava flows produced only during the 1904 eruption. 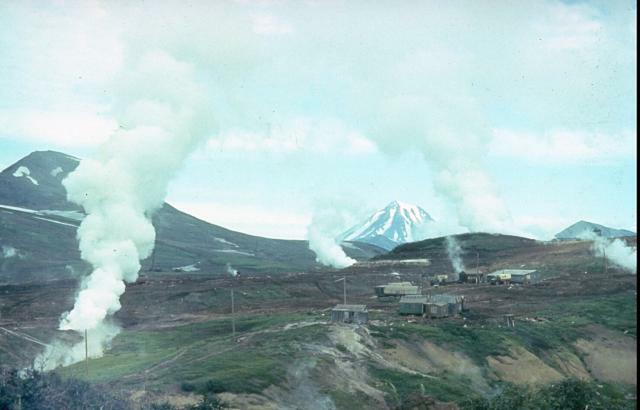 Geothermal development is planned at Mutnovsky, which has the highest heat capacity of any volcano in the Kuril-Kamchatka arc. Selyangin O B, 1993. 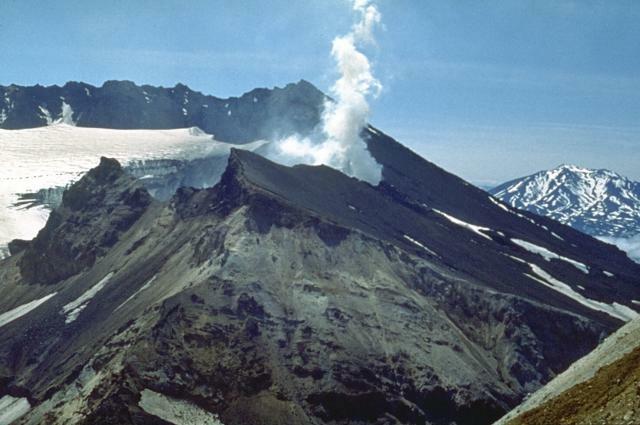 Mutnovskiy volcano, Kamchatka: new evidence on structure, evolution, and future activity. Volc Seism, 1993(1): 17-35 (English translation 1993, 15: 17-38). There is data available for 45 Holocene eruptive periods. Reference List: Kiryukhin et al. 2014. Kiryukhin, A. V., J. Rutqvist, and M. A. Maguskin, 2014. Modeling of the vertical deformations during exploitation of the Mutnovsky geothermal field, Kamchatka. Proc. World Geotherm. Congr.-2015, Melbourne, Australia. There is no Emissions History data available for Mutnovsky. 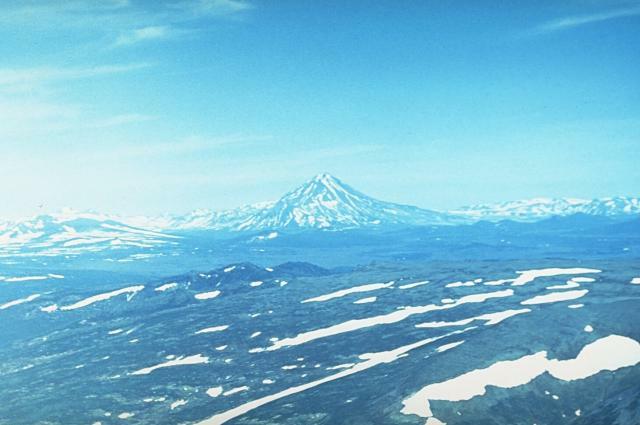 Massive Mutnovsky (center), one of the most active volcanoes of southern Kamchatka, is formed of four coalescing stratovolcanoes of predominately basaltic composition. Multiple summit craters cap the volcanic complex, which is seen here from the west. Historical eruptions have been explosive, with lava flows produced only during 1904. Geothermal development is planned at Mutnovsky, which has the highest heat capacity of any volcano in the Kuril-Kamchatka arc. The glacier-filled southern summit crater of Mutnovsky volcano is seen here from the NE with Asacha volcano in the right distance. This crater is part of a 1.5 x 2.1 km wide double crater with steep walls 50-250-m high that caps the summits of northern and southern Mutnovsky stratovolcanoes. Four smaller craters cut the northern rims of the double summit crater complex. A vigorous steam plume rises from the historically active crater, which cuts the western rim of northern Mutnovsky crater. Dark-colored linear volcanic dikes, the conduits of previous eruptions, cut altered pyroclastic rocks exposed in the crater wall of northern Mutnovsky volcano. Photo by Oleg Volynets, 1971 (Institute of Volcanology, Petropavlovsk). 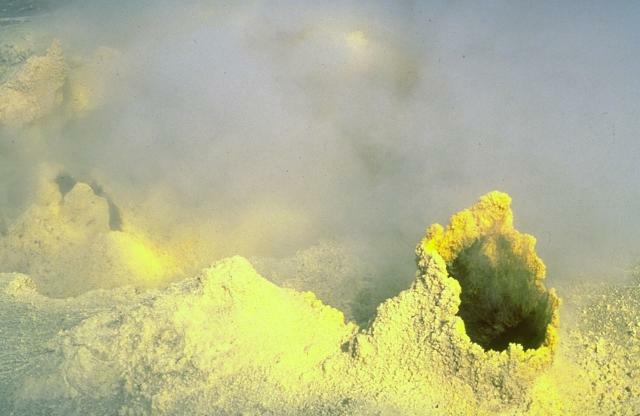 Steam rises from a sulfur-encrusted fumarolic vent on Mutnovsky volcano. The vent is about 2-m high. Widespread fumarolic activity at Mutnovsky occurs in the northern Mutnovsky crater and in the historically active crater. The Verkhneye fumarole field covers a 3200 sq m area of the NW part of the active crater. The Donnoye fumarole field on northern Mutnovsky occupies a former crater lake. Steam plumes rise from geothermal prospects drilled during the late 1970's on the NE flank of Mutnovsky volcano. The wells yielded a steam-gas mixture from depths of 60-1200 m. The steep-sided Vilyuchik stratovolcano appears in the background to the NE. 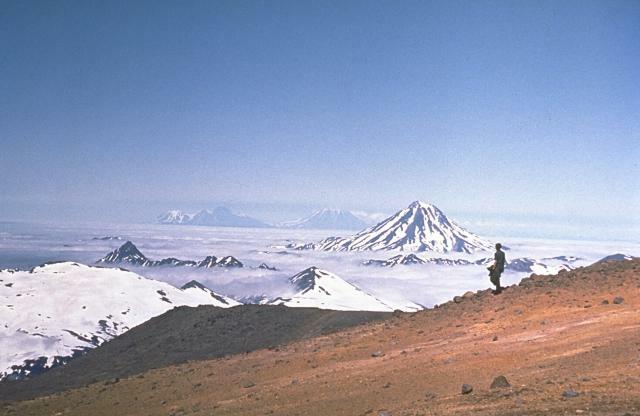 Photo by Kamchatka Volcanic Eruptions Response Team, 1986 (courtesy of Dan Miller, U.S. Geological Survey). 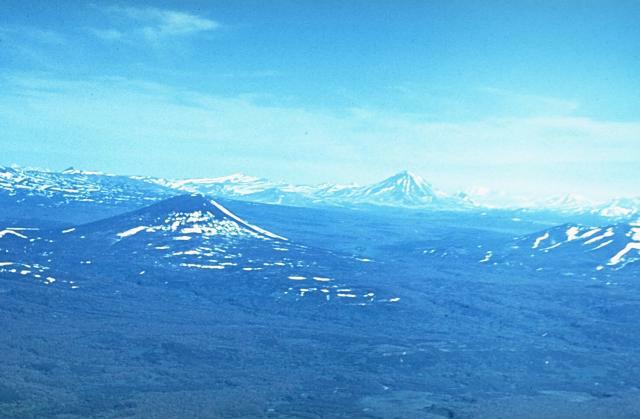 Sharp-topped Vilyuchik volcano (right center) rises NE of Mutnovsky volcano. The steep-sided stratovolcano last erupted during the early Holocene. Clouds fill one of the snow-mantled summit craters of the Mutnovsky volcano complex, one of the most active volcanoes of southern Kamchatka. Koryaksky (left) and Avachinsky (right) volcanoes rise in the distance across cloud-covered Avachinsky bay. Large Eruptions of Mutnovsky Information about large Quaternary eruptions (VEI >= 4) is cataloged in the Large Magnitude Explosive Volcanic Eruptions (LaMEVE) database of the Volcano Global Risk Identification and Analysis Project (VOGRIPA).